Next generation graphics were an offer 2K Czech couldn't refuse. The first Mafia game lived up to the promise of embodying an Italian gangster in the mid-Twentieth Century without that pesky Godfather license getting in the way. Mafia II was even better, and given our industry's proclivities for sequels, it seems odd a Mafia III wasn't on Take Two Interactive's books. An unnamed source from the 2K Czech studio that made the first two games leaked the fact that Mafia III is in fact under construction, and it might just be intended for the as-yet-unannounced PlayStation 4 and Xbox 720 consoles. The source from within 2K Czech told the Eurogamer.cz website that the third Mafia installment was initially planned for this generation, but was pushed back to accommodate the newer consoles. 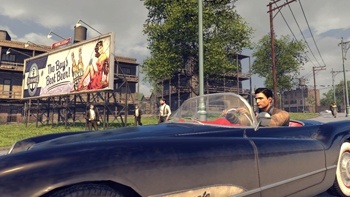 The potential release window for Mafia III is in 2013, according to the source. After contacting 2K Games for a comment, VG247 received a terse replay. "2K [Games] does not comment on internet rumor or speculation," the representative stated. While many of us news-starved nerds will grasp at whatever straws we can regarding the next generation of consoles, this was the first rumor that actually got me excited about a potential game with new hardware. Imagine if Mafia III used the facial technology in another Take Two game, L.A. Noire and delivered it in a photo-realistic presentation. How awesome would that be?